When it comes to bakeware, we all know it can get pretty dirty over time. Whether it’s a gunky glass baking dish or an aluminum cookie sheet that has baked on grease and cooking spray! I am going to share the best way to remove bakeware stains and get them looking like new. 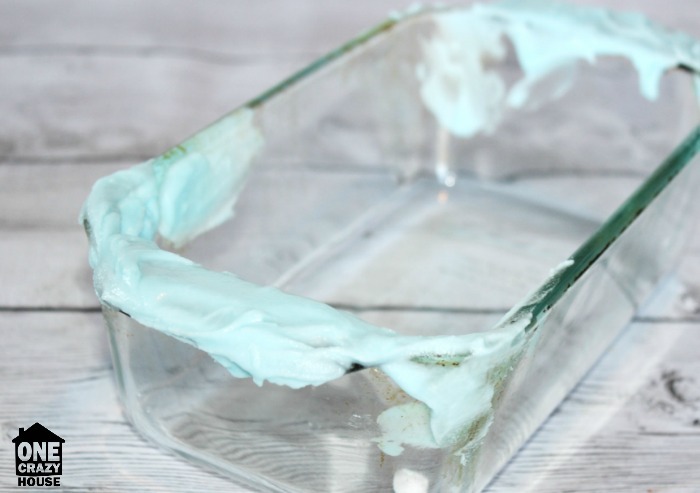 With a little patience and elbow grease, you can use these two methods to get your baking dishes and cookie sheets shining again, and looking like the day you bought them! It is okay if your bakeware is extra dirty, you can still get it clean, it will just take a little time, but in the end, you will be happy to stick through it and have a fresh and clean dish! I’m sharing two different methods to remove bakeware stains, one for glass and one for aluminum! Both of these are the best way to remove bakeware stains in my experience. I will say once you get them nice and clean, try to keep up on it, and the process of keeping it looking like new, won’t take near as long! This is my tried and true go-to method for my glass baking dishes! I am a huge fan of Dawn (the blue kind), it works great at eating away any stuck-on grease and grime! You can try a different brand of dish soap if you prefer, this is just what I recommend and use. In a bowl create a paste using 1/4 cup Dawn dish soap and a 1/2 cup baking soda. Once you have a thicker consistency, apply it to the areas on the baking dish that is stained. Allow this to stand for 30 minutes. Then add more baking soda, and grab a sponge with a little grit to it, and scrub away at those troubled areas. Soak in hot water, and keep on scrubbing. If you missed some spots just repeat as needed. This works for any aluminum bakeware – cookie sheets, jelly pans, loaf pans and so on. If it is aluminum it will work great at breaking down the grime and freshening up your pan! Sprinkle baking soda over the stained area of the pan. Pour some hydrogen peroxide into a spray bottle and spray over the baking soda. I like to spray quite a bit so it is all wet. This will help it work better. Sprinkle a little more baking soda over the mix you just sprayed and let it stand for an hour. Come back with a scrubber and start scrubbing away any grease or stuck on grime. Wash in hot water, and repeat the process if you didn’t get it all removed the first time! Sometimes I do come back within the hour and spray a little hydrogen peroxide on top of the baking soda if it begins to look a little dry during the wait time. I don’t know that this is necessary, I just do this if I am at home and think about it. These are my two ways to really remove those stains from your bakeware! I hope that if you try one or both of these methods you find success with them as well! Also, check out this post to learn ways to remove even more stains from your belongings!